Howdy, partner! 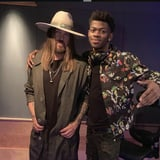 I reckon you've heard Lil Nas X's remix of his hit "Old Town Road" featuring Billy Ray Cyrus. And if you haven't, you better yee-haw your way to updating your playlist because this one is a banger. The 19-year-old rapper and 57-year-old crooner dropped the country-trap tune on Thursday as a follow-up to Lil Nas X's original 2018 hit. The release comes shortly after Billboard decided to remove the song from its Hot 100 Country Songs charts, which was followed by backlash and conversations about race in the country genre. The remix perfectly combines country vocals and rural lyrics with a trap beat and hip-hop flair. Lil Nas X posted about his excitement over working with Cyrus on Instagram, sharing snapshots of the two posing together. The young artist also shared a video of them in the studio and listening to the final outcome. "You're a light in this world, man. You're gonna shine," Cyrus tells Lil Nas X in the clip. "People are gonna see you from all over the universe." The song has pretty much taken over Twitter, and fans are going wild over the remix. Not only are they loving the actual sound - again, you need to listen to it - but they're also obsessed with the dynamic between the two artists. "Boy you made Billy come out of retirement for that Old Town Road," one person wrote. "A freshman + a graduate." This new bop has quite a few people ready to purchase a cowboy hat and boots and embrace the hip-hop/country genre - as we all should (*tips hat*). Listen to the track below before reading some of the most hilarious reactions!